Basil, garlic, pine nuts, olive oil, parmesan... Have you guessed yet? This week I discovered a new favourite brand to supply my treat days with all things Italian and yummy. Outside Kings Cross Station I stumbled across an incredibly tempting food market. The result of my mooch was an unexpected purchase of fresh spinach pasta & kale and broccoli pesto from the company The Cooking Cooks Italian Kitchen. After a few mouthwatering scoops of tasters and a good chat with the owner Alice I seemed fairly assured this innovative company were on my wavelength when it came to food and uber fabulous chinwagging about which pasta goes best with chicken or fish. The choice of fresh pastas and pesto's they have on offer made my choosing fairly tricky. 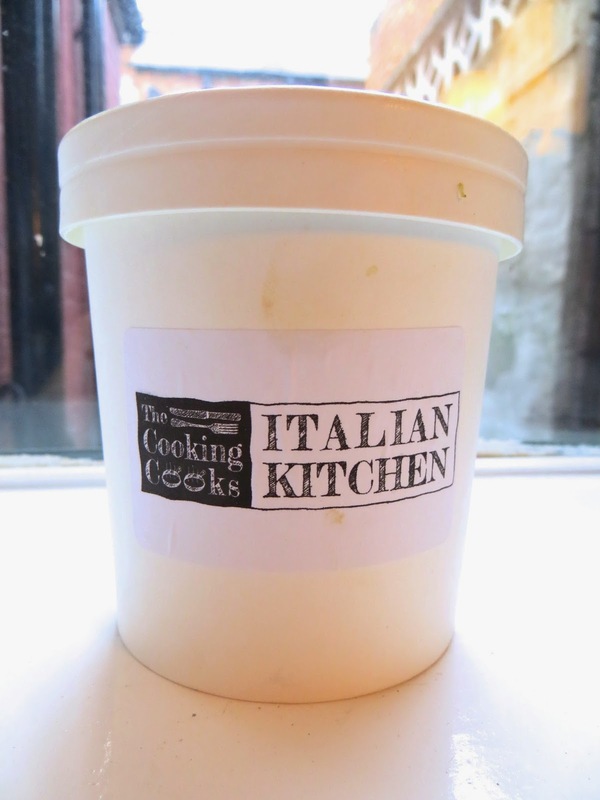 Also available in various sizes were (fully recyclable of course) Pesto pot flavours in Almond, Cherry Tomato and Basil or Rocket and Gorgonzola. Large shells, twirls and spaghetti shapes in beetroot, spinach, squid ink, onion seeds and my pick spinach, were laid out in the prettiest portioned parcels to accompany the pesto. Homemade, fresh and smelling so good they were wrapped in my paper bag before I could blink. I made my buys into an indulgent but green bowl of dinner with chicken, french beans, spinach leaves and cashews thrown in. It was nothing short of delicious. I'll definitely be keeping my eyes peeled for these Italian delights in other locations this year.